A couple of months ago, the hubby and I were back in our college town and we ordered an appetizer at one of the bars while we waited for a table to open up at the restaurant down the street. We ordered some black bean and avocado egg roll type things. They were really good, but they were fried- not my favorite…so when hubby suggested I recreate them at home, I immediately made a note in my phone. Then I promptly forgot about them for several weeks. The other day I came upon the note in my phone and decided to give them a whirl at home.I changed them up a little bit by adding shrimp. I used wonton wrappers and baked them instead of frying. These were super easy to make, have very few ingredients and were a big hit with the hubby! 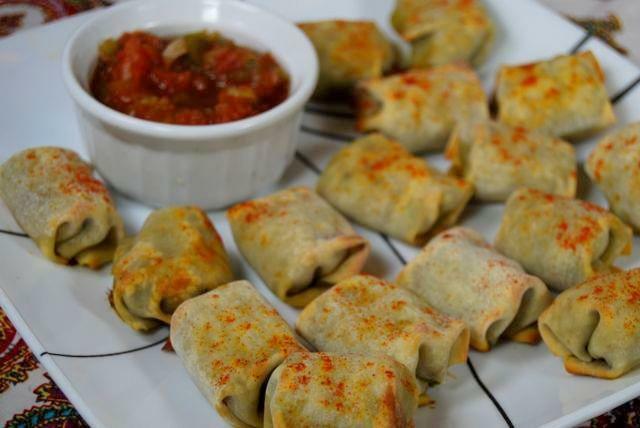 They’d make a great party appetizer and are a fun alternative to chips and dip. In a small saucepan, heat some EVOO over medium-high heat. Saute the onion, garlic and shrimp until the shrimp is cooked through. Dice the shrimp mixture (you should have about 1/2 a cup) and let cool. Mash the avocado in a small bowl. Add the lemon juice, black beans, cayenne pepper and shrimp and stir until well combined. Place one tablespoon of filling into a wonton wrapper. 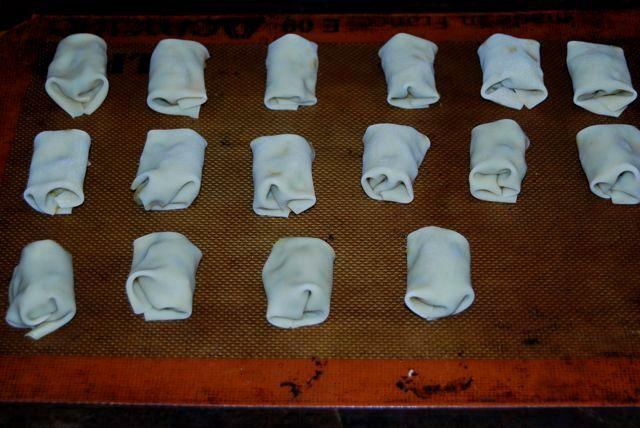 Fold in two of the sides, then roll up from one of the unfolded ends and place on a baking sheet, with them seam down. Mist with cooking spray, sprinkle with paprika if desired and bake at 425 for 12-15 minutes until wontons are golden brown. The hubby suggested that these could also be made in tortillas and then sliced. We’re going to try that next time. What’s your favorite non-traditional party appetizer? This speed was crazy fast for me. 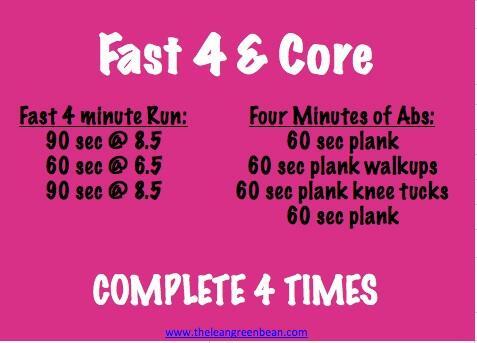 It’s basically a 7:45 min mile, and you end up running just over ½ a mile…then ab work…and repeat. I covered 2.08 miles. haha yeah i need to get onboard that organization train too! These look amazing! Just reading about them I know they would be a hit in my family! 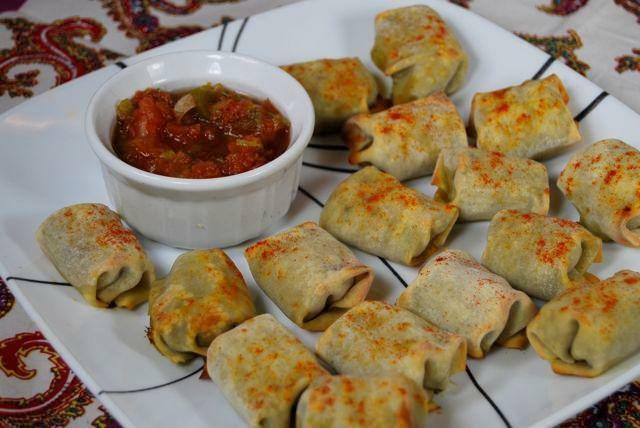 I will be making them for my fam next time I am at home 🙂 We love trying new appies <3 Thanks beautiful. Your husband is extremely well-fed. What a great appetizer. 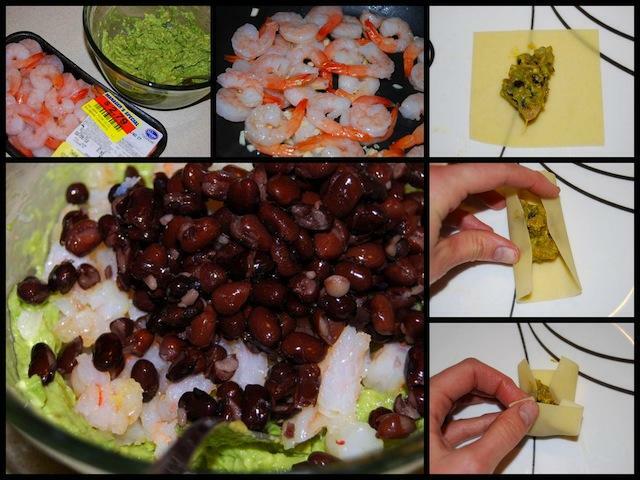 I love anything black bean, avocados and shrimp. I always gravitate towards any chips and dip at a party. i’m a sucker for chips and dip too! Lindsay, I’m all over these. Love this combination of flavors! Yum! 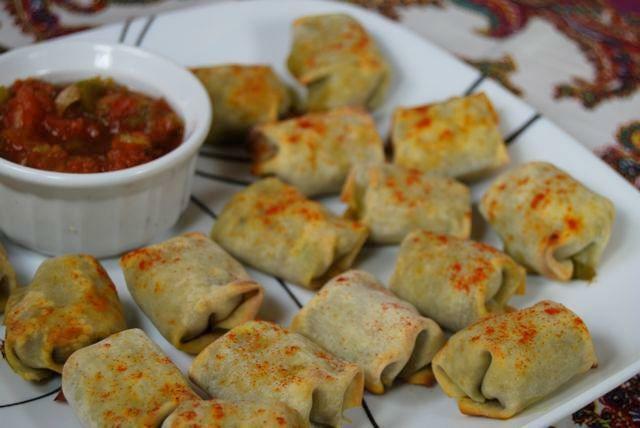 These look really fantastic and are a nice, healthy appetizer! I haven’t worked with wonton wrappers yet…will definitely need to try them! These remind me of the little rolls I used to get at Chili’s and loved! I must make these. MUST! These sound delicious! I’ve never cooked with wonton wrappers before. Do they crisp up in the oven? I love using those Wonton wrappers – this looks like a delicious combination of flavors! One of my favourite apps to make are mini phyllo cups filled with feta, cherry tomatoes, and tapenade. OMG I want those in my belly, asap. They look so delicious. And I love how easy they are! I cannot wait to try these but I will try them using tortillas since I have all of these ingredients at home – yum! Yummy! I pinned this so I have a visual reminder for later. What a cool recipe idea! I will definitely have to save this recipe idea for later. Do you feel the beans really add anything (besides fber + nutrition) to this? I love beans, but thinking of leaving them out and focusing on just the avocado & shrimp flavors. i think they’d be good without the beans as well! you could also try adding something like red peppers if you wanted, or just shrimp and avocado is a great combo! Yummy!! Those look awesome 🙂 Way to make them healthier by baking them instead of frying them. Thanks for sharing! thank you so much! i’m a big fan of wonton wrappers 🙂 so versatile! mmm… looking super good lindsay! Loving the wonton bites. Must make them soon – where do you get your wrappers? i find them in the refrigerated section near the tofu! Can you say YUM! Those look incredibly tasty! Made these today while being an #elf4health! haha had no shrimp, or black beans, so made them with chickpeas and the avocado with extra cayenne pepper… so delicious! Had about 10 with salsa and fresh mini tomatoes over a bed of lettuce for lunch, and tomorrow will be the same. Yum! omg sound so good! love your version. glad you liked them!